Tens of thousands of people have signed up to a new service from two mobile-only banks designed to help problem gamblers. One former addict says this "gambling block", available on the banks' apps, helped him beat his addiction. "I'd be setting my alarm to wake up at 4am to do a first bet," says Danny Cheetham, who began placing bets in his early 20s. "I'd plan my route to work so I could call in to a bookies which opened early for commuters." Danny, who is now 29, found himself betting in bookies, on slot machines and online. He gambled a lot on football, which he doesn't even like. He began relying on overtime from work and on payday loans. In the course of eight years, Danny, who's from Stockport, estimates he lost more than £50,000. He sunk into depression and moved in with his dad as he could not afford to pay rent. 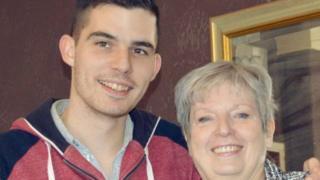 It was the death of his mum Christine in 2015 that he says was the turning point for him - but he was not able to kick his habit until he signed up to a gambling block with his bank, Monzo. The so-called challenger bank is a mobile-only version of a traditional bank. Once the block is activated by the customer, it can spot any transaction that person might try to make with bookmakers - either online or in a shop - by using merchant category codes. It instantly stops the transaction from happening, before any money has left that customer's account. If a customer is tempted to place a bet in the heat of the moment, there is a 48-hour cooling-off period before the block is switched off. There is also a daily limit on cash withdrawals. Two million people "at risk"
Monzo CEO Tom Blomfield says the block was introduced because customers asked for it. "We have a team of people who work with vulnerable customers and they were getting this feedback quite often" he says. More than 25,000 customers have signed up to the bank's block since it went live in June. "Not all of those were problem gamblers [but] about 8,000 people did have a history of gambling," says Mr Blomfield. "We've... seen a 70% decline in their gambling transactions so [it's made] a really big impact." Another challenger bank, Starling, is offering a similar type of block. It's gained 20,000 users since its launch in June. The Royal College of Psychiatrists is calling on the big five high street banks - Lloyds, Santander, HSBC, RBS Group and Barclays - to offer the same type of service. Doctor Henrietta Bowden-Jones told BBC Radio 4's Money Box: "If you are unable to access funds, this type of gambling block can save people's homes and their families." The banks say protecting vulnerable customers is a priority and they are always looking at new ways to do that. The Gambling Commission is talking to financial institutions about how to improve protection for problem gamblers. Three years on from taking his first steps to beat his gambling addiction, Danny says he is happy. "And I've actually got money in the bank which I never thought I'd have," he says. "I'm well on target to being debt-free by my 30th birthday, which is my next one, and I just don't feel depressed or helpless like I used to." He says he can now think about his future and - although he will have a bad credit file for up to six years - he says this will give him time to save for a deposit for his own place. "I just don't feel like it's an endless battle any more." You can hear more on BBC Radio 4's Money Box programme on Saturday at 12:00 BST or listen again here. If you're worried you might have a problem with gambling or know someone who does you can get help here.